In the last forty years there have been very few notable pop-gospel artists who have been strong enough to build a mainstream audience. In Australia we had the first million record selling chart album with the singing nun, Sister Janet Mead, who was a one hit wonder with her electrified rendition of The Lord’s Prayer. While Mead’s Holy Orders were a significant novelty factor, she did not keep attracting non-church audiences past that song. 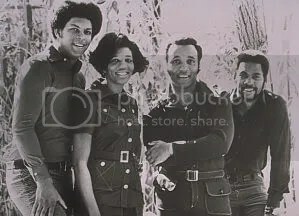 In contrast, perhaps my favourite 1970s gospel artist who did draw worldwide attention is Andraé Crouch – especially when he was with his band The Disciples. In albums such as Keep on Singin’ (1972), Take Me Back (1975), and This is Another Day (1976), Crouch fused traditional Gospel with soul, funk and folk rock to get a sound that had emotional guts and artistic brilliance. Crouch is the real deal. His performing career started in 1960 with the Church of God in Christ Singers which included everyone’s hammond player of choice, Billy Preston. But when he formed the Disciples in 1965 they elevated to such heights of popularity as to find themselves performing on Johnny Carson and at Carnegie Hall. Crouch went on to collaborate with Quincy Jones, Paul Simon, Michael Jackson and Madonna and even had Elvis Presley perform one his compositions ‘I’ve Got Confidence.’ Andraé Crouch is living proof that gospel artists that are truly great musicians can be appreciated for their talent by the mainstream: his songs still get sung in churches (mainly in America). Beyonce and Lady Gaga may lay claim to some of the biggest audiences worldwide, but Australia’s Hillsong Church has bumped off both pop powerhouses to score a top three berth on the ARIA albums chart. Their latest album God Is Able, released to coincide with the annual Hillsong conference, debuted at number three this week, entering ahead of Beyonce’s 4 and Lady Gaga’s Born This Way, which stand at fourth and fifth respectively. The fact is, in the last thirty years, the only musicians singing about Jesus to consistently draw a mainstream audience have been those singing in traditional gospel (The Blind Boys of Alabama and Mavis Staples) or classical styles. While Andraé Crouch’s pop-gospel did wow the world, not many others have done likewise. In my next entry I will write about the great secular artists who found Jesus, the many who flirted with Jesus.